Sealing your asphalt driveway is an important maintenance step that’s needed to prolong the life and keep it looking like new. Asphalt driveways are a simple yet effective mixture of asphalt, stone and sand. When properly maintained an asphalt driveway can last 15 to 20 years. 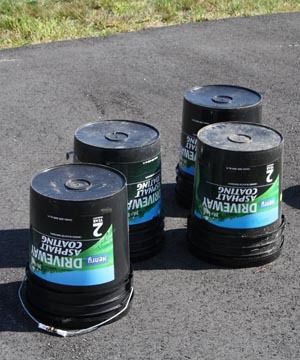 Maintenance of asphalt driveways consists of filling asphalt pavement cracks and sealing your driveway. Protecting asphalt from harmful UV rays from the sun. Ultra Violet rays from the sun can break down asphalt over time causing it to lose strength and become brittle. Sealers help prevent water from entering the surface of asphalt pavement. As a driveway ages is develops small cracks and loose surface aggregate which allows water to penetrate it’s surface. In the winter months the water can freeze causing further cracking and deterioration of the pavement. 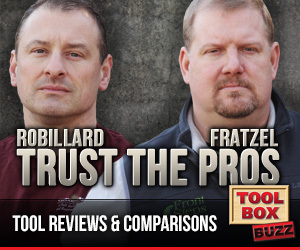 Protect your driveway from damaging oil and gas spills. 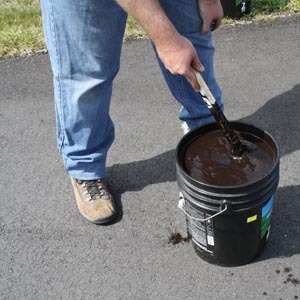 Oil and gas can damage your asphalt driveway leaving stains, holes and soft spots. It’s very important to note that new driveways should not be sealed. An asphalt driveway should be a minimum of 6 months old prior to sealing. This is important as new driveways have too much oil on the surface which will result in the sealer not bonding properly. Sealing your driveway is an easy DIY project that can be tackled over a weekend. Below are all the steps you need in order to seal your driveway and keep it looking and performing like new. The first step in successfully sealing your driveway is thoroughly cleaning the surface from sand, debris and oil stains. The surface of asphalt driveways is quite porous and able to hold a significant amount of sand, dust, debris and oils. Before sealing the driveway you must remove all of those contaminants. Clean any oil / grease / gas stains with an approved asphalt driveway oil remover. 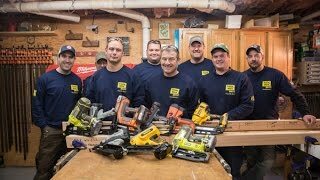 Most hardware stores and big box stores sell these products. 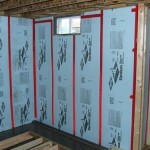 Be sure to follow the manufactures recommended application. Blow off a majority of the debris with a leaf blower. I’ve found that using a gas powered leaf blower significantly improves how well you can clean the driveway. Rinse off the driveway with a hose and nozzle or a pressure washer set on a low pressure. Be sure to allow the driveway to dry prior to beginning the sealing process (unless it’s a very hot day). Before you drive over to the local hardware store or big box store to purchase sealer be sure to calculate the area of your driveway. Driveway sealers list an average coverage on the label so you’ll have to do some math in the store. I recommend that you get an additional 10% of product based on the average coverage that they list. 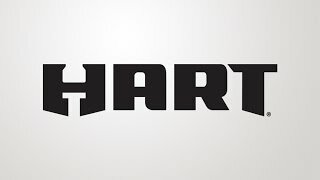 The last thing you want is to run short at the very end. 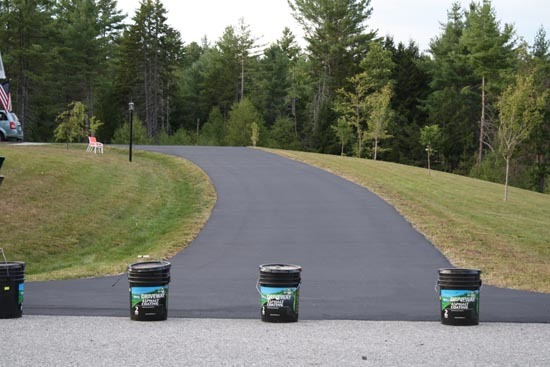 For our driveway we’re going to be using Henry HE130 Asphalt Driveway Coating which says it will cover 400-500 sq. ft. for tightly compacted surfaces (our driveway is only a year old and it has a very tight surface). Our driveway is 3,500 sq. ft so we’ll assume an average coverage of 450 sq. ft. per bucket or 8 five gallon buckets. Just to be safe we purchased one additional bucket as back-up. The day before you seal the driveway place the buckets upside down. This will help mix the sealer and reduce the amount of stirring that’s required. Sealers contain a great deal of solids which settle to the bottom of the buckets so this simple step really helps out the mixing process. Asphalt driveway sealer needs to be mixed very well before you apply it. Most products recommend stirring it with a stick until the liquid has a consistent viscosity. I recommend mixing for a minimum of 2 to 3 minutes or longer if large clumps still exist. 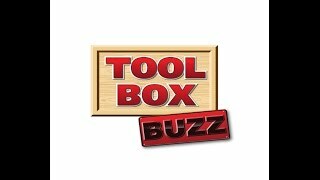 One trick that I learned years ago was using a paint brush near garage doors, concrete slabs and walkways that you don’t want sealer on. Before you get going spreading the sealer with the squeegee get the edges along the doors finished first. 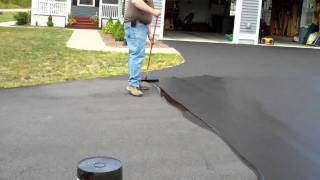 Once you’re ready to start sealing the driveway you’ll want to start at one end and work from side to side advancing along the length of the driveway. I’ve found that it works best if you pour about 1/3 of a 5 gallon bucket onto the pavement and work that amount until you need more. As you can see above you’ll need to be careful when you pour the sealer onto the pavement. It’s fairly runny and will splatter and run quite a bit. Be sure to wear old shoes, old pants and preferably gloves (which I didn’t and now regret!). Once you’ve poured the sealer onto the pavement it’s time to start spreading it using a squeegee. Most home centers sell a combination squeegee and brush. One side has a brush and one side has a squeegee. The squeegee works great for spreading the sealer out while the brush is good for doing a final smoothing pass and along the edges. 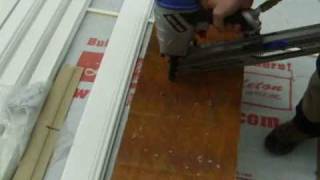 Below is a short video showing how I spread the sealer in motions from side to side. As you can see in the video the squeegee makes quick order of spreading the sealer. I like to be sure that each pass overlaps the previous by about half the width of the tool. 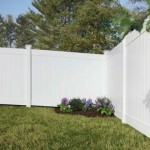 This helps ensure a good coverage and an even application. Once you’ve finished applying the driveway sealer you’ll want to keep cars off of it for at least 24 hours and preferably 48 hours. It’s also important that you apply the sealer when there’s no chance of rain for 48 hours. I think Fall or Spring is the best time to seal your driveway, I would recommend avoiding extreme heat as the sealer dries very fast making application difficult. If it is really hot most sealers recommend lightly wetting the driveway (no puddles) as it helps slow down the initial cure. Save your empty buckets and line them up at the end of your driveway to keep cars off. After about 4 hours the sealer will be dry enough to walk on. This particular driveway (3,500 sq. ft) took approximately 4 hours to seal, 2 hours to prep and $165 to seal which is less than five cents per square foot to seal. 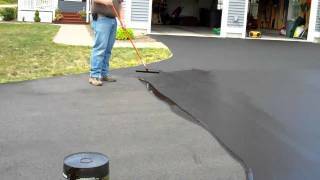 This asphalt driveway cost about $5,000 (base coat and finish coat) so a $165 investment every two or three years is short money compared to replacing the driveway. All the steps in this article are perfect! The video even taught me a better spreading technique. Thanks! Thanks for a nice description of the process as I’ve always been curious what’s involved. One thing I didn’t learn was how you fill the cracks in the asphalt, which I would expect your would do before putting the sealer on. My expectation there would be a process similar to preparing walls before painting, where you use spackle to fill the holes? Filling the cracks is certainly an easy DIY project. 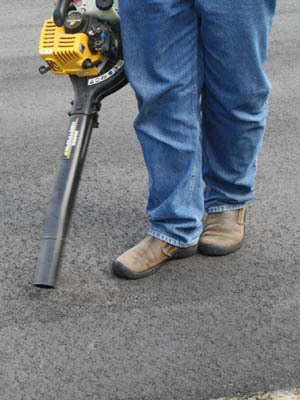 Most asphalt crack sealers come in a large jug that has a pointed tip. 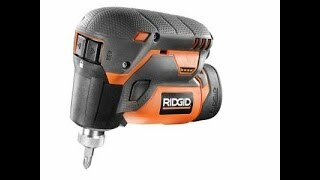 The tip can be used to pour the sealer directly into the cracks. We recently moved into a home with an asphalt driveway that probably hasn’t been sealcoated in more than 10 years and has hundreds of cracks in every direction giving it an appearance similar to alligator hide. It was resurfaced at some point (probably 20yrs or more earlier) and the top layer is coming apart piece by piece. I just want to keep it from completely falling appart for another few years while we save up to replace it in the entirety. I’ve heard that mixing silica sand with sealcoat and using that to sort of patch and prime the cracks using a large paint brush to work the mixture well into all the crevices can help preserve the structural integrity (at least in the short term) while at the same time improving the appearance by diminishing the depth and breadth of the cracks. I’m guessing its best to allow the material applied to cure for at least a week or so of warm, dry weater before applying the top coat of sealer (on the theory the cracks being pretty deep, the filler would take some time to setup enough to give the top coat something solid to bond to.) I’m going to sealcoat it one way or another I’m just wondering if it will be worth the extra time, expense and effort to do the patch/prime process and whether the silica sand as additive concept is even viable. Can you please advise your opinion on this approach? Thanks. Dave – Sorry for the delayed response. It’s been a very busy week. Sand Sealing is often used on rough roads and poor condition driveways. I’ve seen it done commercially quite a bit but I haven’t personally seen it down on a driveway. 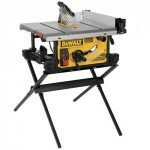 The theory however is solid and worth looking into if you want to prolong that driveways life. My understanding is silica sand is mixed in at a rate roughly of 1 pound per gallon of sealer. I’d try a few ratios and see what works best, start with a high sand to sealer ratio, keep adding sealer until it’s workable.